According to the Charlotte Knights News article, when the gates open at 6:00 p.m. fans will have a chance to meet Brian Jordan. Admission tickets are required. Make sure to arrive early. 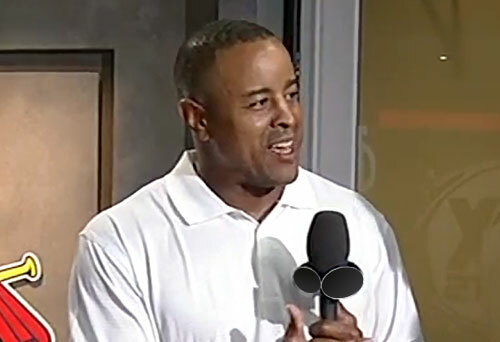 Brian Jordan is a former two-sport professional athlete who had a career from 1989-2006 both as an NFL safety and as an MLB outfielder. In the NFL Jordan played for the Buffalo Bills in 1989 and the Atlanta Falcons from 1989–1991. In the MLB Jordan played for the St. Louis Cardinals from 1992–1998, the Atlanta Braves from 1999–2001, the Los Angeles Dodgers from 2002–2003, the Texas Rangers in 2004 and the Atlanta Braves again from 2005–2006. Jordan is a National League All-Star for 1999. Sports Speakers 360 is a booking agent for pro athletes. If you would like to book Brian Jordan for a speaking engagement, appearance or endorsement, contact a Brian Jordan booking agent for fees at 1.855.303.5450.